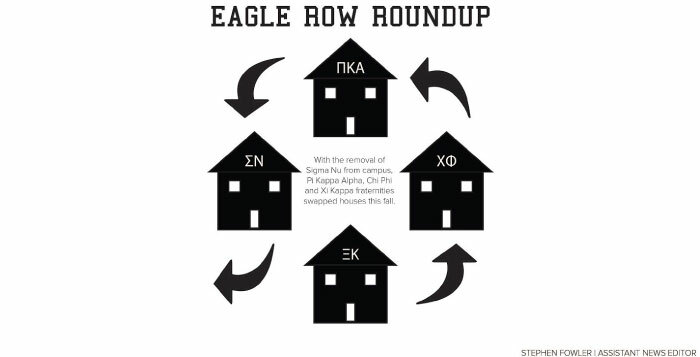 Eagle Row has shuffled the occupants of three fraternity houses on Eagle Row, with Pi Kappa Alpha (Pike), Chi Phi and Xi Kappa fraternities moving from their 2013-2014 locations. On March 21, members of Pike were notified by Jeff Tate, assistant director of sorority and fraternity housing that they will relocate from their house at 22 Eagle Row to the Asbury House at 764 Peavine Creek in the fall. However, after Sigma Nu fraternity was suspended from campus on May 1 for five years for violating the University’s anti-hazing policy, Pike moved into Sigma Nu’s old house at 10 Eagle Row. Chi Phi moved from their house at 13 Eagle Row to Pike’s old house at 22 Eagle Row, and Xi Kappa moved from the Asbury House into 13 Eagle Row. As reported in a March 25 article in the Wheel, the house changes resulted from discussions around the occupancy policy and several fraternities’ ability to fill the houses. At the time, Pike was unable to fill their house and faced relocation, bringing the opportunity for Chi Phi and Xi Kappa to move as well. Over a week into the semester, members of the affected fraternities are optimistic about the changes and the future opportunities to grow as organizations on campus. College senior and Xi Kappa Risk and Liability Manager Adam Chan, who lives in the house, wrote in a statement to the Wheel that “it’s a great year to be a Xi Kappa man,” and the new location presents an opportunity to promote cultural awareness and develop a close brotherhood. In addition, Chan sees a greater impact in recruiting new members with the new house. “Having our own space is important to us because it allows us to actively use the space for recruitment, something that we didn’t have just two years ago when I rushed,” Chan wrote. Goizueta Business School junior and Chi Phi President Daniel Sokolov wrote in a statement to the Wheel that Chi Phi is taking the move in stride. For College senior and Pike Vice President Lucas Buyon, the past few weeks in their new house has shown promise for the year to come.